On the edge of the Mississippi Delta sits the quiet town of Satartia. Its most dominant feature is the Yazoo River, which runs through this small community of less than a hundred residents. However, two separate encounters, decades ago, cast a dark shadow on this small river town. Events that many of the people who live here may not be aware ever happened. "You could see this yellow-green, bubbling water out there and you could. We started to hear moaning and stuff and we left." Texas ghost hunter and original Unexplained contributor Janice Raley says she was directed to this spot by an old farmer who recounted a similar experience from years before. Even the farmer was afraid of this place. "He showed me from the road. He wouldn't come down here even though he worked the land." Raley says the experience was coupled with the smell of rotting flesh, an overwhelming sense of panic and a voice inside her head telling her it was time to leave. "It was truly terrifying." Raley swore never to return, until she was convinced rather reluctantly by the Unexplained team to relive her encounter. "I honestly didn't think I'd come back here and...here we are." I asked her of all of her investigations, if any other place ever had such an effect on her. "No! Not that. There's really not another place I can think of that I said that I would not come back to." Raley, along with the Unexplained investigative team is back to gather evidence of any paranormal activity. Almost as soon as we arrive, we began having equipment problems. Janis begins loses battery power on her Sony Mavica digital camera after only a few shots. We placed a Trifield meter near the area in which we were working. A trifield meter measures the electromagnetic frequency in the space around it. 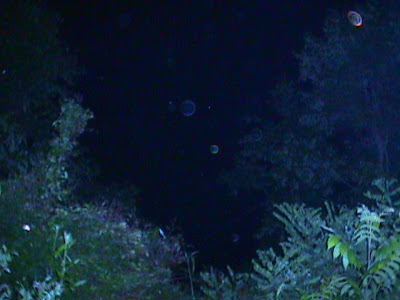 Some investigators believe it can detect the presence of spirits, which are indicated by a change in an audible tone. It immediately began chattering erratically. Janis confirmed that she had never heard a meter sound like that. Before long, we started to see things as well. 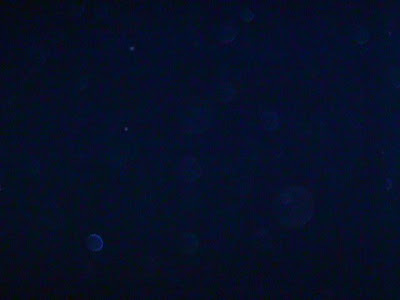 I was watching lightning bugs over the river when I noticed two or three red flickers. Janis confirms my sighting, "Okay, I saw the red one. It looks like the back of a camera. I mean, the red light on the instrument." 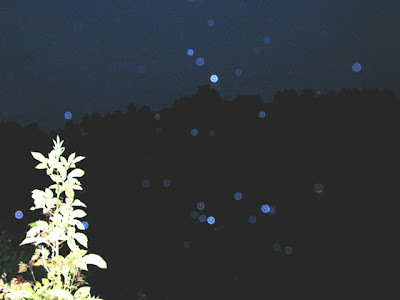 Lightning bugs clearly do not produce a bright red flashing light. And what could have been generating that over the Yazoo River? Then, minutes, later there was something behind us. As I attempted to describe the figure, my microphone went dead. Coincidence? Perhaps. Everyone else were looking in the direction of the river. 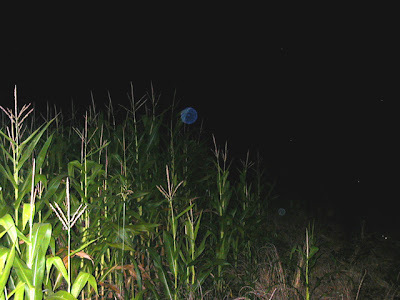 I was studying the area behind the group, deeper into the cornfield, because I had the sensation that something was watching us. 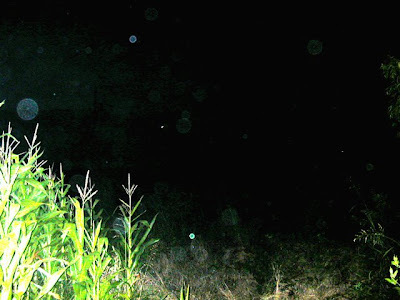 Not that a huge corn field, next to a huge river in the middle of night would produce such an impression! After watching for about five minutes, I saw a mist that was rather upright. It wasn't like a wide, broad area of mist or fog. It went across the path we came up, moving right to left and then went into the corn. 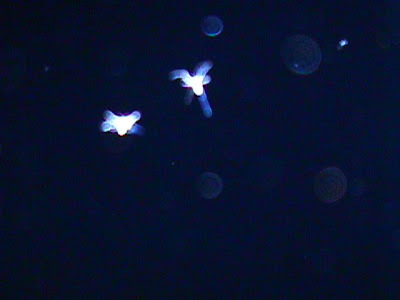 Three weeks later with a full moon, the team returned without Janis to gather more evidence. For the second time, we encountered equipment problems. Photographer Drew Foster's audio board on his news camera was damaged beyond repair. This second night of investigation also yielded some compelling visual evidence. 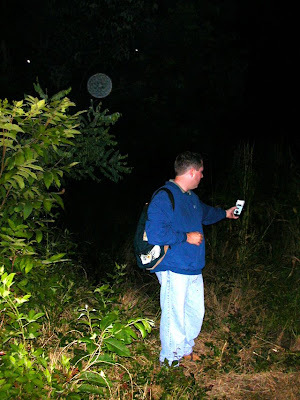 Orbs are considered by paranormal investigators to be visual evidence of spirit activity. 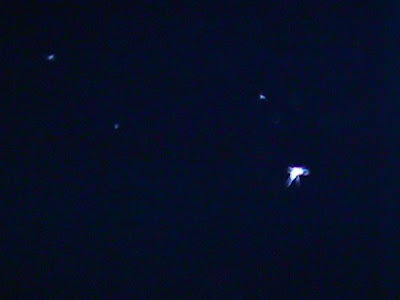 Orb images collected at this location varied in size, color, and intensity. The variety of which we've never encountered in one investigation. We've determined they're not bugs. 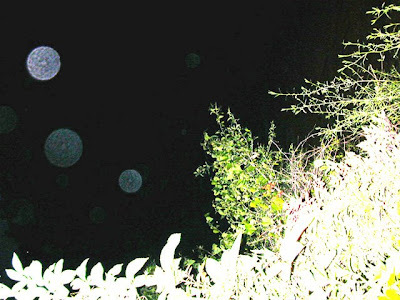 One excellent photo has two orbs clearly present with a flying insect. 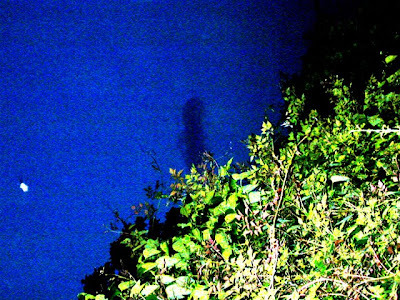 One picture piqued our interest more than any others, a shadowy figure perched at the top of some trees. It was a clear night and there isn't anything behind the tree upon which a shadow could be cast. Is it a ghostly figure? 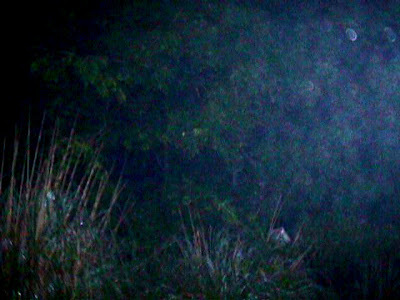 It closely resembles the misty figure I witnessed just weeks before. Maybe we'll never know, but what we do know is this place scared one ghost hunter so badly it took her three decades to return. Although our encounters weren't as traumatic they were convincing nonetheless. With or without our presence, the corn will continue to grow and the river will roll in the place we now call "the gates of hell." 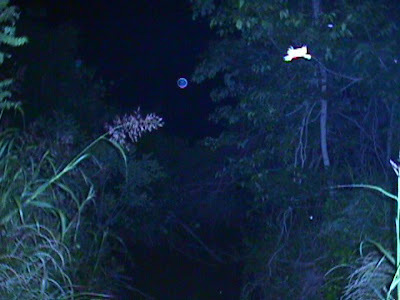 Ghost hunter Janice Raley says she's not sure what happened at this location. However, the man who led her to this spot told her it was related to the Native Americans who originally lived in the area. The River was given its name by the French Explorer, La Salle, in 1682 when the found a small Indian tribe with that name living near its mouth. It is the second longest tributary of the Mississippi flowing into it from the east. Only the Ohio is larger. The first electrically detonated underwater mine was invented and used by Confederates on the Yazoo River in 1862 near Vicksburg to sink the Federal ironclad USS Cairo. A second, non-electrical mine, sank its sister ship, the USS Baron DeKalb near Yazoo City in 1863. Its hull is still visible during low water. There are 29 sunken ships from the War Between the States beneath the Yazoo River. Mississippi has 15 river ports, Yazoo City being one of them. The River was the cause of Yazoo City's founding, and was its lifeline to the outside world for its first 50 years. Yazoo (a strange, exotic sound) Yachou, Yakou, Yasoux, Yason, Yasoons, Illasus. Then there was Oalsees, Yahaas, Yassa, Yasoves, Yasus. The word became slightly distorted with the "S" sound becoming a "Z". What does it mean: River of Death, Leaf, Hunting Ground, To Blow on an Instrument The meaning is actually unknown. Attempts to give it meaning all evolved when European settlers tried to fit the strange sounding word into the patterns of the language of the Choctaws. The Choctaws had a village in eastern Mississippi named Yazoo. According to linguists who have studied the language patterns of the Choctaws, it was a word remaining from the Yazoo Indians' language, which like the tribe itself, was entirely separate from the Choctaws. There is one legend that Yazoo means "death" because the French, who named the river witnessed scored of Indians, defeated in battle but refusing to surrender, march into the river to their deaths. Another surmise is that it is from the Choctaw for "hunting ground". Yashu means "to go", and owa meaning "hunt", but no one really knows.